The first RTP for Skamania County was adopted in April 1995. The plan has been updated over the years with the 2018 Update being the most recent. The RTP uses 20 years as the horizon year and incorporates the latest available data. The RTPs for Clark County, Skamania County, and Klickitat County are the region’s principal long-range transportation planning documents. They represent a regional transportation plan for each county and are developed through a coordinated process between local jurisdictions in order to develop regional solutions. RTPs are developed to meet the magnitude of transportation issues facing each region and the need for cooperation between jurisdictions in order to develop regional solutions. The RTP is a plan which will meet the transportation needs over the next 20 years by implementing a regional transportation planning process. 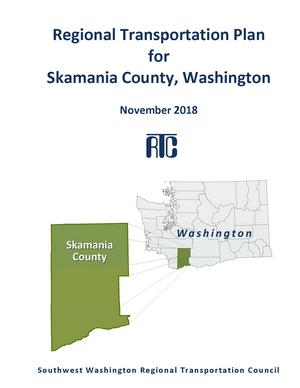 The full plan for Skamania County is available for download in the sidebar. To encourage and promote the development of a balanced, safe, efficient and affordable regional transportation system to meet the mobility needs of people and goods, within and through this region, and minimize transportation-related air pollution.